I’m working on a crochet mini skirt! The last time I crocheted a mini skirt was in 2006 for Crochet! Magazine (March 2007 issue). Today I completed the third and fourth ideas I have for a decorative hem. Finally a Crochet Mini Skirt for Fall! It may be a trendy item this year, but every fall I want a crochet mini skirt to wear with leggings and boots. This dark grey is a perfect neutral color for me. I’m calling this design Carbonite after the name of this newest color of our Lotus yarn. 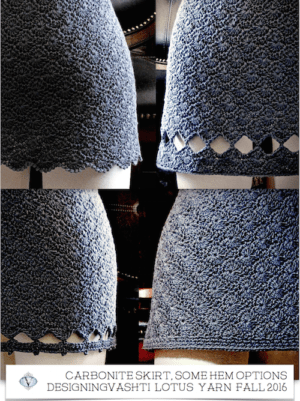 My goal was a solid stitch pattern with a brocade-like texture and a nice drape. Does the stitch pattern look familiar? It’s a modified “Catherine Wheel”, a.k.a. “sunburst stitch”. This popular crochet stitch pattern is often used for thick wool scarves and afghans. I tweaked it a bit to prevent gaps that commonly happen between the tall stitches of the “wheels”. I have a few more idea for hems I’d like to try but I don’t want them to slow me down too much. Each time I try a hem idea, I block it, let it dry, style and photograph it. Then I have to edit each photo a bit so that the tones and light levels match ok. I take each photo on a different day and time of day. A few were taken during Hurricane Hermine! Next I’ll make decisions about the waistband. This Carbonite crochet mini skirt design has a Ravelry project page that you can check to see more updates.